It was just after the Lantern Festival had culminated on a warm night in Chiang Mai. I had met up with my friend Yvonne and admired her back tattoo as we walked to a local bar to bond over Changs. We got on the topic of tattoos and I admitted to her that I had twice made an appointment to get some ink, and twice backed out, deciding that what I thought I wanted ultimately lacked enough meaning to carry on my person forever. This was when I heard about the magical monk tattoo, and finally felt I might have found the perfect tattoo for me – something that had a deeper meaning than any other tattoo could possibly possess. His tools are a long bamboo pole, and ink made from snake’s venom, Chinese charcoal ink, and palm oil. We made plans to meet again in a few weeks in Bangkok, and get the tattoo done by Luang Pi Nunn, who we later realized is considered the most famous monk in Bangkok to perform this art. Flash forward several weeks: I awoke at the ripe hour of 4:30am to meet up with Yvonne to get our tattoos done. Oh, who am I kidding? I was too excited/scared to sleep at all. Aware of just how popular Wat Bang Phra is amongst locals to get their Sak Yant tattoos, we knew we had to catch the 6am bus that leaves from the Victory Monument in Bangkok in order to be first in line. We got to the temple seamlessly after alighting the bus and catching a delightful moto-taxi ride through rice paddies as the red sun was rising. We arrived at the wat, a little unsure what to do next. A little Thai man roused from his slumber and helped us purchase our offerings for 65 baht, then handed us pink envelopes to put additional offerings into. In all, I donated 120 baht (USD$4 –not bad for a tattoo!). I somehow ended up at the front of the queue. There were about 15 of us in the room – locals, Yvonne and myself. I had wanted Yvonne to go first, given she already has tattoos and therefore would naturally be less anxious than I would be (right?). However, I was beckoned by the monk, and there was no turning back. I crawled into position, bent over a pyramid pillow, and dug my nails into my arm so that I would be able to focus my pain on another area. Two men on either side of me held my skin taut while the monk, a piece of paper separating his hand from my skin, as he can’t touch female flesh, dipped his long bamboo needle into ink. The tapping began. We had not pre-discussed what he was going to do. 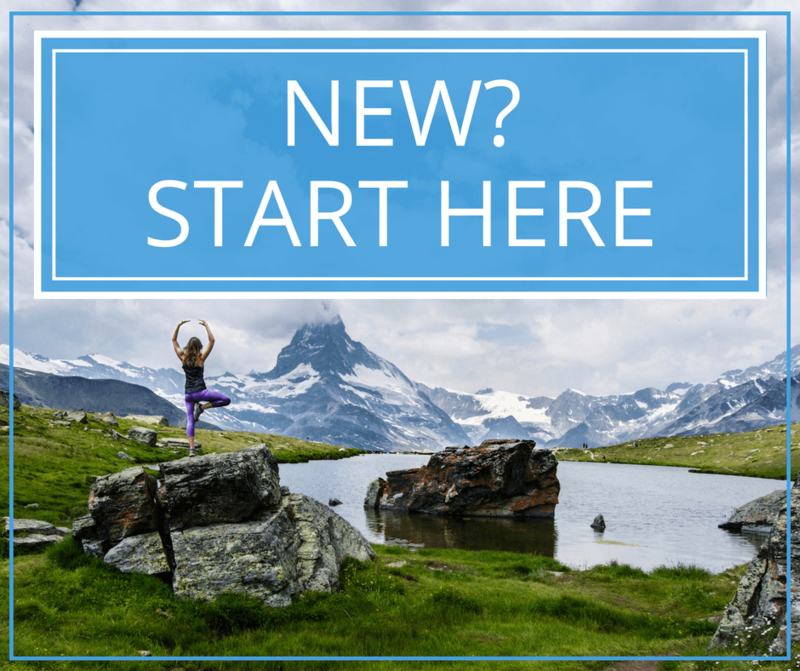 We had not selected a precise location – he just went for it, I knew from the beginning that I had to put faith in his design choice and placement based on his interpretation of my aura – based on his opinion of what blessing I needed most. I knew that I would have no say in what tattoo I got or where. Ten minutes and roughly 3,000 strikes later, I had a new tattoo. I had expected the pain to be out of this world, but in reality, it has nothing on recovering from a shoulder surgery. I’d give it a 7/10 on the pain scale. It was therapeutic, in a way, and only lasted for ten or so minutes. As he finished, he blew on the tattoo to breathe power into it as he chanted a blessing. He then moved on to Yvonne unto whom he bestowed the same tattoo. Though we were not allowed to take pictures in the room where the process takes place, I snuck one of Yvonne quickly with my iPhone. When hers was finished, we left the room and excitedly took pictures of each other’s tattoos to so that we could see our fresh ink for the first time. Both looked amazing. He had given us the Hah Taew. 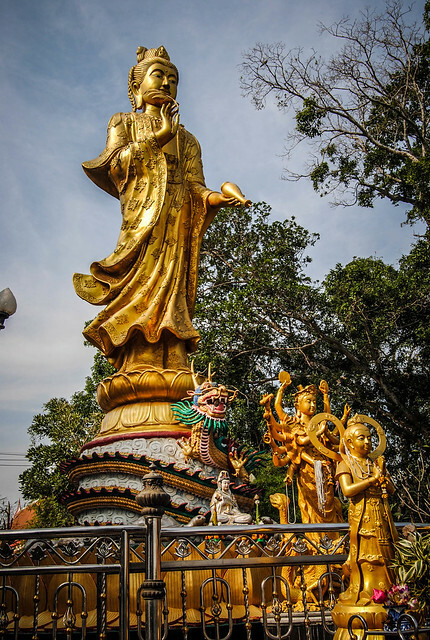 Though I will need to get the exact wording translated, as each monk has his own version of the Hah Taew, it generally bestows a blessing of loving kindness, lifelong success, charm, good luck, and protection against bad luck and evil spirits. This was easily one of the most magical and enduring parts of my journey so far. I will forever remember the beauty of the day and the uplifting feeling of the blessing. After all, how can I forget? I’ll carry this reminder on my shoulder forever. Have you had a spiritual experience while traveling? Comment below! 2015 UPDATE: I’ve recently been informed that the main monk who gives tattoos has switched to a gun rather than a bamboo needle. His poor wrists have gotten too tired. Therefore, if you want a bamboo tattoo, I’d highly recommend meeting with an ajarn — a monk in training — which takes place in a much cleaner environment, gives you an opportunity to discuss which tattoo you’ll receive, and still ends with a blessing. The experience sounds absolutely amazing and is probably how I’ll get any future Sak Yant tattoos. Click here to book an ajarn tattoo session in Bangkok or in Chiang Mai. No, you do not make an appointment, you just have to show up. No, it’s not a new needle. No, you do not communicate with the monk. It will not be a new needle, and you do not get to choose the tattoo you’ll be given! Would I take the risk again? No, I would not. I have had blood work done long since getting the tattoo and have come out fine, but I have to say, I was sweating that one a bit and realize now that, despite how amazing the experience was, it’s not worth catching a disease. Most importantly, please remember, this is not just a souvenir, it’s something that has deep spiritual meaning. Please read this post carefully and understand the customs before you go. Happy traveling! 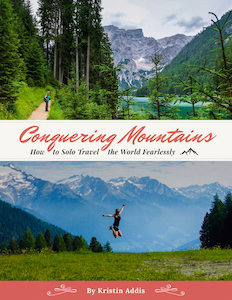 For a complete A-to-Z guide on solo female travel, check out my book, Conquering Mountains. 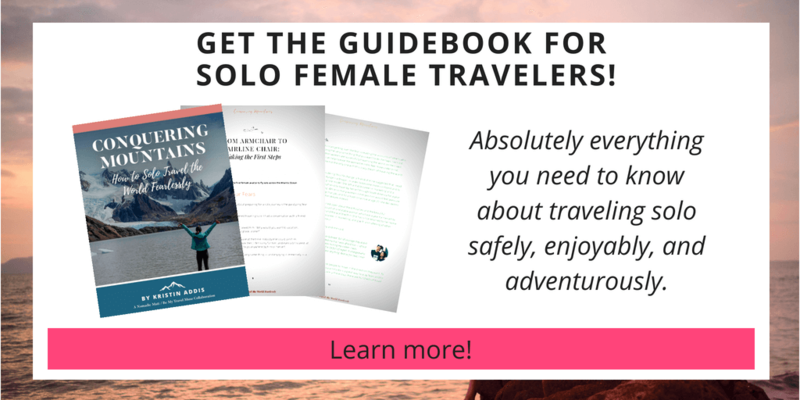 Besides discussing many of the practical tips of preparing and planning your trip, the book addresses the fears, safety, and emotional concerns we women have about traveling alone, featuring my advice and over 20 interviews with other solo female travel writers and wanderers. 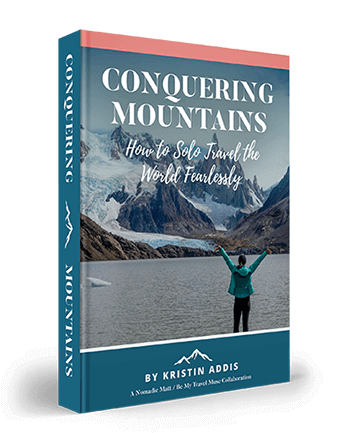 It also has money-saving advice from the experts, info on working on the road, and everything you need to make planning your trip of a lifetime a quick and painless process! Click here to learn more about the book and start reading it today! Love this Ava and so glad you are happy with your tattoo. I don’t think I could ever like something long enough to have it permanently which is why I have yet to get a tattoo. But this sounds like a cool experience! Glad I like it, too! It helped that the same guy did my friend Ian’s back and I saw his prior. I could tell the artistry was good. He didn’t actually touch me. love it! The brother of my homestay “Dad” in Thailand was a traditional Thai tattoo artist and he gave me one on my wrist. They’re so unique and special and the perfect way to remember a trip to Thailand! I’d love to see it! Do you have photos of it up on the interwebs? I LOVE this!! I can’t believe it only took 10 minutes – it’s so intricate! You are brave, cause I would be really scared not being able to choose where the tattoo goes, but I love where he put yours! Everyone is shocked he did it so quickly! I guess most people with this tattoo suffered an hour plus. I just got a tattoo while traveling through Japan, I’ve also gotten one in South Korea, but I have to say that yours is very lovely and the story makes it even more special. 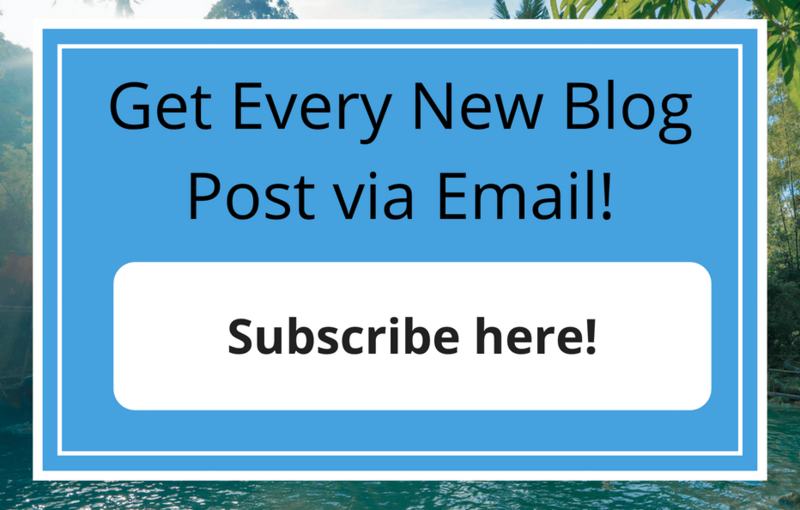 Thanks for sharing an inked abroad story! photos please! would love to see it! What an incredible story! The tattoo is absolutely gorgeous. You’re so brave, I don’t know if I could have done this! That is so cool! Good for you guys for doing this. I doubt I would be that brave! I could kind of tell by the stamp he put on my back and the location that he was going to give me the ha thaew, I had about a split second to recognize it before he got started, but it was the one I had wanted after all. Woow.. Coool.. Do you ever been to India or Kerala? I have not but it’s definitely on my list! Wow! Love it! How safe is it though, in terms of the spike they use… is hasn’t been in anyone else’s skin has it? Honestly, he does use the same one on everyone and cleans it in-between. This is why I was really happy to go first – before anyone else had been tattooed. Ian Ord’s blog which I linked above goes into the safety a lot more. He did a lot of research before getting his done a few months ago and decided that it was safe enough to get done after speaking to some medical professionals. Still a risk, though. Thanks so much, looks like an incredible experience. Welcome to the club darling!!! So happy you finally got inked, and I don’t think there is any better way than to do that. What a beautiful blessing and so fitting of your personality. I’m definitely going to be getting a bamboo tattoo when I am in SE Asia. How do you book an appointment for a Sak yant tattoo ? If you want to visit an ajarn you can follow the link on the page. If you to go the wat you can’t book an appointment. Wow, this is a gorgeous story. I love the end tattoo and would love to get one. Maybe one day… haha still a bit nerve wracking for me I think! It was for me too. I didn’t sleep at all the night before because I was so nervous and excited! so cool! i’ve read about these magic tattoos, but never a detailed story of someone getting one. fascinating. were the other people there mostly men, or do women typically get them as well? thanks for sharing your story! It’s mostly men who get them, though there were some other women there as well. It’s actually somewhat common for women to get an “invisible” tattoo, with just oil instead of ink, because it’s not always desirable for Thai women to have visible tattoos. We were sure to specify that we wanted ink! I’m going to Thailand and thinking of getting a Sak Yant Tattoo as well. I love the meaning behind it. How do you know what to do ritually (approaching the monk and the offering, etc.)? The other people in the room motioned to me when it was time to bow, etc. They were very sweet and understanding. Chances are good it will be placed somewhere on your upper back. They don’t do below the waist. You can try showing the monk a photo of the one you want and hope he’ll comply. I just decided that I liked all of them and would be happy no matter what. Another thing you can do is visit a tattoo artist if you want total control, however, you lost the meaning in that case. loved your post! I am hoping to be returning to Thailand (Was there Nov/Dec 2012) April/May 2014! Getting a Sak Yant is on my to do list as I just love the story/history behind it all! I know it is common for women to get the Sak Yant in oil as opposed to ink- were you able to let them know you wanted ink prior or was it determined by the monk? It is common for women to get the sak yant with oil as you mentioned. The monk seemed to know that since we were foreigners, we were probably seeking one with ink, and he squirted ink into the cup he used to dip the needle in. You could always point to ink if it looks to you like he’s going for oil. I didn’t ask him for a specific place, but you can always try. I don’t want to say he’ll do it because I am really not sure if he will or not! As for sterilization, he cleans the bamboo needle between each person, but not use a new needle. Needless to say I was glad to have gone first. wanna get a sak yant at bang phra too, but confuse whether woman can get one or not by the ajarn, some says cant but other say yes you can. 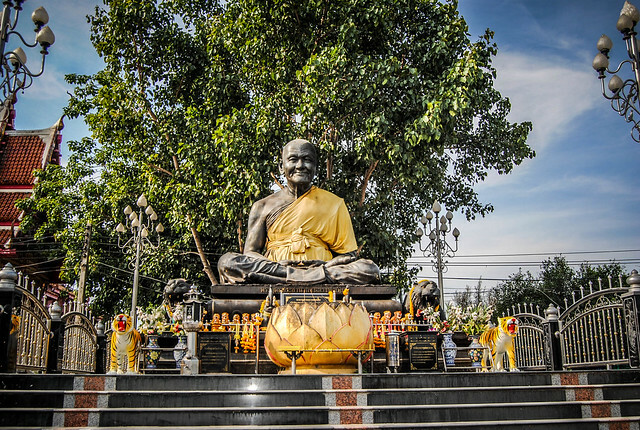 so , on my next trip to bkk, definetly will go to bang phra ! This is awesome! I’m into tattoos, especially religious tattoos, and I’m going to study abroad in Chiang Mai for 4 months this fall. Were there certain days that the monk would tattoo that I should be aware of? Also how was your healing? I think he tattoos every day. Healing was pretty easy, given it’s a bamboo tattoo. Within three or so days you’re good to swim and within ten you should be almost completely healed. It feels like a bad sunburn at first but that subsides with time. It’s a risk for sure, but I’ve been fine. I put benpanthen on after. Wow, what an amazing experience, thank you for sharing. I’d be anxious about it, but it really does sound like such a special experience. Thank you for sharing. Based on ur experience, for women to go for such tattoo, what is best for her wear? As i know the men will remove their shirt. is there any translator when you went to temple? I wore a button-down shirt backwards and undid the top few buttons when it was my turn. There is no translator. There are no words exchanged anyways. He just does what he feels like doing! Hi is there any full address ? or just tell the taxi driver will do & they know where to bring us? the monk do there everyday? If there is a fixed address I’m honestly not aware of it. The motorbike taxi I described should know exactly where “wat bang phra” is. To my knowledge the monk is there daily, yes. I’m thinking on religious holidays it’s not open, but I’m really not sure. tks. was thinking wheather can book a taxi from bbk to & flow. Going tiget this done myself in a few weeks, just a quick one, how easy is it get back from he temple to bangkok when your done? Really easy. Just hop on the bus that’s right outside of the wat. It starts running later in the day. Beautiful tattoos and photos, thank you so much for the post. Wish I could do this! I got a tattoo the day I turned 18. I love tattoos because they can help you express yourself. I plan on getting lots of other tattoos in the future. Hopefully I can get my second one soon. Hi I am headed to Thailand in april for two to three weeks, just wondering how long between getting the design of the tattoo and getting it done did you wait? Is two weeks enough time? Loved this post, inspired me to get one seems so peaceful and beautiful. The answers to your questions are all in the post. It all happened within 15 minutes, as I wrote, and the designs are standard designs that have been around for centuries. Great story – a friend and I are going to get it this weekend. Not sure if you answered above, but are there photos displayed to find out what it means? Love the tattoo! Heading there this winter and planning to do this. Do you know if these tatoos fade more than usual ones? Cool tattoo idea. Always a good idea to choose something unique. It will serve as a permanent reminder of your trip. I am staying in Bangkok, do you know of another Wat where the needles are each time new? That’s how the wats operate, but if you want a tattoo with a new needle just visit a tattoo artist. You lose the authenticity but it’s a trade off. I’m not sure if we should point to the tattoos as the reason for the AIDS but it’s always a risk. I read women must have transparent ink?? Is this true?? Haha, well, if you just look at the photos in this post it will answer your question. Some Thai women just want the blessing and not the ink, so they ask to have it done in oil instead. When foreigners go, the monks know they want ink, so they do it in ink. Nice tattoo but too bad you had to disrespect them by “sneaking” a picture. Well, it is all about you. Lots of people have taken pictures and even video of the process. I have the utmost of respect for them. Hello. You mentioned something about a stamp? So the monk has a stencil type thing he uses before he starts? Yes and yes. Lots of people have this tattoo and that sometimes bothers me. Good to see you displayed the proper respect for the monks’ customs while getting your bargain $4 tattoo. They request that you don’t, but if you look at just about every post on the subject, full videos have been made. I have the utmost of respect for the monks and what they do. 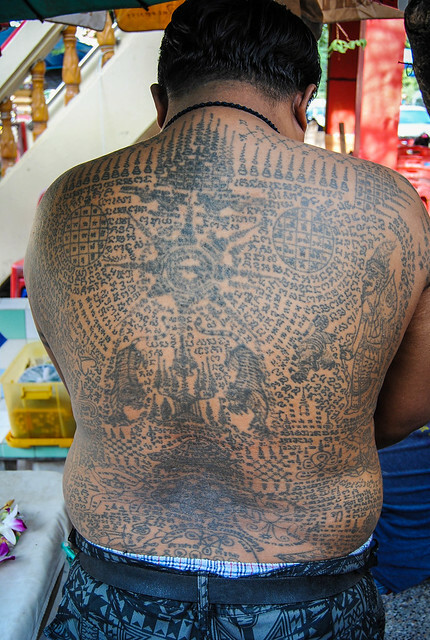 i would like to make a tattoo in Wat Bang Phra. I would like to know if they make tattoo all day long or if they make them up to a precise time. I think to go on my last day in Thailand but i’ll not be there before 11.30 a.m and i don’t know if i can do it. Do you have more informations about this (the closing time). I don’t know what time it closes but if you don’t get there until 11:30 you risk not getting a tattoo because the queue will be hours long by then. i really hope to be there in time. I want to do this tattoo so bad but im so scared of getting a disease since they dont used new tools. I’d suggest visiting an ajarn – a monk in training. well ,i’ve been really interested in sak yant and i’ve read alot of different stories of different peoples experiences and i wanted to know, how do you deal with the “rules” that go with your sak yant and i heard that every year you have to get it reblessed or something like that, do you do something like that or no? Thank you and lovely post by the way! That is one of the many rules. There’s a big ceremony each March at the temple where people do this. It’s up to you of course how strict you’ll be with it, depending on if it’s aesthetic for you or deeply spiritual and religious. $4 I couldn’t stop thinking bout that and ya kinda lost me do u think u could spare it! It was so spiritual and calming, yet exhilarating. 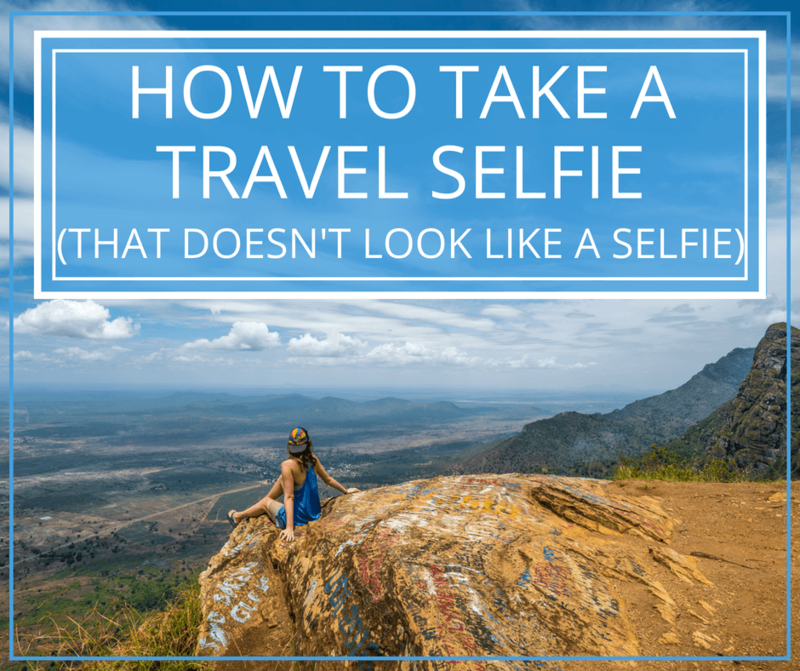 Hi Kristin, This was a great article! This has been on my bucket list for quite a long time. I will be in Bankok in a few weeks and would like to have the same experience. However, heeding all of your warnings, I’m curious about the äftereffects of the tattoo. Did you have any unusual side effects? I have heard that these can sometimes cause trancelike state or reaction to chemicals used in the ink. You should be ashamed of yourself for donating so little money to the temple for receiving so much in return. Paul, they only ask for a 120 baht donation. That’s what everyone pays. They aren’t in it to make money, they want to bless people. Did you ever think it might be an insult to put a huge amount of money forth when they’re only asking for a small amount? 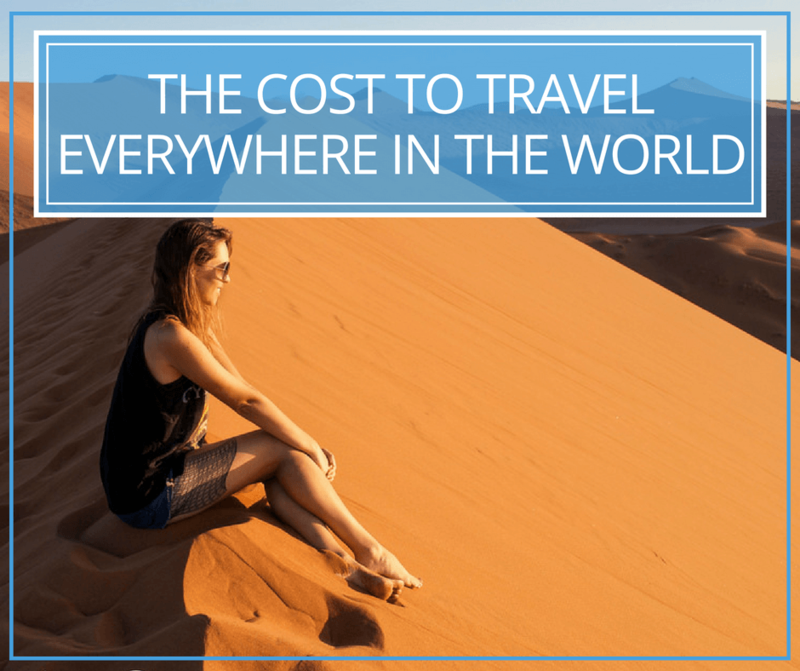 Why should I pay more than the locals? Because I’m a foreigner? I don’t support that notion. It’s a communal pot and everyone is watching. I think it’s important to better understand the concept before making such remarks. I’ll also point out I was part of a blogger effort that donated thousands of dollars to elephant conservation in Thailand earlier this year. I do help out and give back, and certainly realize Thailand has given me very much in return. Are you sure you weren’t able to choose your design? I want to get a tattoo here but I want a choice. I wouldn’t think the information on wiki to be incorrect..
Am I sure I didn’t choose my design? Yes, I’m sure. I don’t lie on my blog. There would be no point in that. I suppose if you can speak Thai you can make a request but everyone I know who has gone had the same experience that I did – the monk chose and there was no discussion. I did see the banner but he doesn’t ask you first if you have something picked out. My friend Ian did show him a photo of a design he wanted and ended up walking out with that tattoo. Of course, you lose some of the novelty of the monk choosing for you, which I thought was cool. If you want to be able to speak English and choose a design I’d suggest an ajarn. I wasn’t implying you lied. I asked if you were sure you “weren’t able to choose”, I wasn’t questioning that you didn’t choose. There was a banner posted on the wiki page, so I’m sure some can choose if they are aware they can. Many do allow the monk to choose because that is part of the experience, however they have many tattoos to do, and I find myself thinking they may choose the smaller designs to get through people quicker. However I haven’t been yet and this may not be the case with all monks. I think I will go with an Ajarn in Chiang Mai. The link you posted for the Ajarn in Bangkok is quite expensive, paying $600 USD for a tattoo done by an Ajarn is quite expensive compared to the $3-$5 tattoo done by the monks. True but I would’t bargain hunt for something that’s on my body forever and I do mention that it’s not a new needle if you go to the monk. I honestly don’t know how easy it is to choose the design. There wasn’t any indication it was a possibility when I was there. It’s also common to go in a sort of order. Best of luck whatever you end up doing. Hi Kristin. I went to Wat Bang Phra January 30th, 2015 with my daughter and her friend. My daughter’s friend got a Sak Yant. I don’t know which monk performed it but when it was her turn she did not get to choose the placement or the tattoo she received. Just in case anyone was questioning this. Her Sak Yant was placed on her upper right arm. 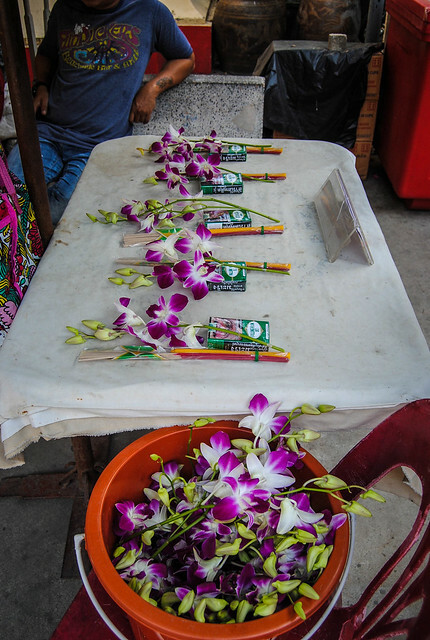 She gave a donation of 200 baht, flowers, cigarettes and incense. Yep, I noted that as well in the post. You don’t get to choose. Hello The link you posted to join The disciple is only a PayPal link no adress ! So i would Like to know ( before spending 250$) if you might know the place where we can find the monk ? Nope it’s a link to my friend Ian’s website which discusses the session, what you can expect, and how to book. It’s near Bangkok and he’s the one who knows where the location is. The ajarn is moving towards only accepting bookings through Ian since he has had some people show up who weren’t respectful. Similar problems have arisen at this wat and I feel partially responsible. Due to this I won’t be giving out the address. Hi Kristin. I saw your 2015 update that the head monk at Wat Bang Phra has switched to a gun, but I was wondering if whoever sent you that information gave any indication as to whether or not there are still traditional bamboo needles being done at the temple, just by different artists. Thanks! Yours looks incredible. When I was there he was the only one giving the tattoos. This was someone who visited the wat and reported back that only a gun tattoo was available. You could still check it out for the experience, just to see, but that’s what I was told. I’m going to Thailand in a few weeks and I was wondering if your Sak Yant has faded over time? Also has having it on your back been mostly convenient? Nope they’re still good. upper back is easy to hide and a nice place for a tattoo, I think. I just got my Sak Yant a couple days ago and I love it! I watched the video of your friends Chris and Tawny and actually received the same Sak Yant as Tawny. Definitely an amazing experience. I’m reading through all your posts to decide where I should travel next. Thailand was my first solo journey, but I already want to plan the next one. Any suggestions for a 20 year old? Thank you so much for your insight and all the stories you’ve shared. Cambodia! Vietnam, Indonesia, Malaysia, Laos are great too. You can’t go wrong in SEA. As for the rules, I still eat leftovers and gourd foods. The alcohol one wasn’t one of the rules from Wat Bang Phra, but I see it this way: there are rules in every religion. Most people don’t or can’t follow each and every one. It’s up to you. Also, I was curious as to whether you followed the rules after getting a Sak Yant such as no alcohol? The rules seem kind of loose for interpretation, but I want to make sure I’m respectful. The guides I had made it sound like I could drink but not get drunk and I would like to know how you interpreted the rules. Wow, that’s a really unique style of tattoo! I’m not a huge tattoo person, but I like the ones that have a meaning. I would definitely go in for a tattoo like this, especially if it was done by someone from that culture. I think they look really nice too. Hey I love your story, I am actually planning on traveling to Thailand this summer. I was wondering if you got to choose where you wanted it.Thanks! Hi, so I was wondering, do they have monk in training there, that still use bamboo, or is he the only one who gives the yant. I’m unsure. I know that LPN has switched to a gun for sure, though. Two people have verified. Hi Elisa, As you’ll see at the bottom in the updated section, you can’t be sure you’ll get that one, and you can’t really minimize your chances of getting a disease without being first, but that’s not guaranteed. Also, the monk uses a gun and not bamboo these days. I’d suggest an ajarn if you want to pick the tattoo. Great article! i did have one question, before getting a Sak Yant, are you able to discuss certain things about your past/current struggles in life with the monk? I ask because I feel that would help personalize the tattoo that the monk decides to do. I moved to Surat Thani a week ago and have been looking at different articles regarding Sak Yants. If you go to an ajarn you can do that, but if you go to this particular monastery you won’t be able to talk with the monk beforehand and you can’t choose what you get. Your fate is in his hands. I came across your post before deciding to take the plunge myself! I’m so happy I did it and like you recommended, I took my time to really research what was available in Chiang Ma so that I was getting a safe, personal and truly spiritual tattoo. I’m so happy that society is opening up more to the idea that women can receive these blessings too. We deserve it! I clicked the link to book an appointment with an ajarn but it says the page is unavailable. Is there a way I can still book an appointment? I plan on going to Thailand for the Summer and I want a tattoo. If there’s any resources you can give me I would appreciate it so much. Thank you! It costs $3-ish at the wat itself but as I noted, that’s not a clean needle. If you want a tattoo with an appointment and time from the monk it costs what a normal tattoo costs. Nice article, the process though is a bit risky. I agree that it is not just a souvenir it is more than that. Any sacred tattoo will last for a few years only. The divine power was embedded in the black ink. So do not be a fool by any ajarn. They do not have any power in their hands. Our other that these tattoos are of Buddhist culture that I am a born follower, I have two and I intend to do the third … very good article. Hello! I am going to thailand and vietnam soon and would love to get one of these tattoos but a friend of mine has said I should not get one unless I get a Hep B jab? Did you get one or think that it is necessary for me to get one? Your tattoo is beautiful and has only made me want one more haha, thanks! I think it’s necessary for traveling in general but that isn’t the one you have to worry about with these, that’s Hep C which there is no immunization for. A very good maintained amulet can contain divine power for a century. But the very good sacred tattoo will last for a few years only. The divine power, embedded in the black ink , will be gradually degenerated by many contacting materials such as cloth, water etc.. It’s the same as magnet has lost the power with the contacting metal. And don’t be a fool by any ajarn, they don’t have any power in their palm. If they knock your head, it means they just want to have fun with your head. There are plenty of nasty monks with this kind of behavior.﻿ Mostly they are the orphan who has to become monk since their childhood or unemployed person who can survived in the competitive world. 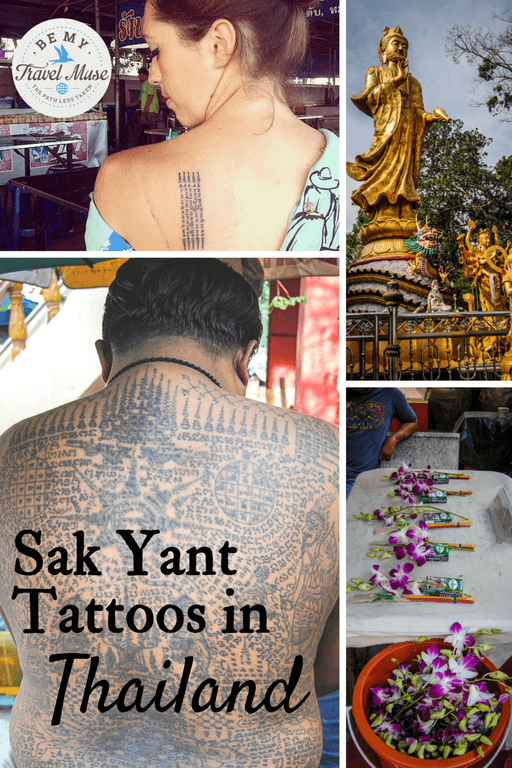 You’ll be blessed to have a Sak Yant Tattoo especially if it really performed by the Buddhist Monks! Got more interested in this traditional thai tattoo. Thanks for the information!